If I look happy in these posts, it's because I really am. It's my favorite time of the year: SPRING!, when the weather is absolute perfection, there are no bugs, and my garden is coming to life. I'm so excited to be able to photograph outdoors again, and have such pretty backdrops behind me, such as this gorgeous white tree! 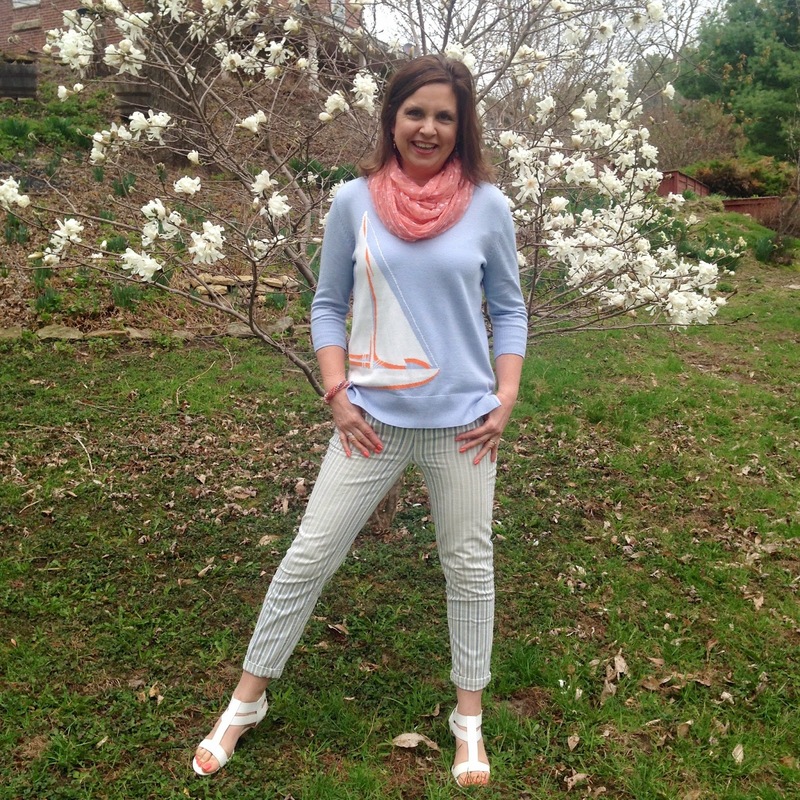 I absolutely love today's outfit, but I fear I may be a walking J.C.Penney ad because both the sweater and pants are pictured in this ad HERE. I was actually in JCP months ago and spotted this sweater and just had to have it. ( I pre-viewed it already in THIS POST.) After I bought it, I started to wonder what I would wear with it, so I looked it up on-line and saw the sweater paired with the striped pants. I thought, 'That's really cute!' So then I ordered those too. Of course I made the outfit my own by adding the scarf, different shoes, and accessories! I wore a white denim jacket (old, Kohls), as my outerwear, because it was still too nippy to wear just the sweater. The stripes on the pants are very light, and there is even a faded spot on the thighs, so the pattern is not too loud. I know a lot of women shy away from printed pants, but if you want to try them, this would be a good style to try because of the softness of the print. My shoes are old (Payless). They are just elastic white stripes with a wedge cork heel. In my previous post I mentioned how much I love the Stylus brand at JCP. I have purchased so many new items from that department, I think I own just about everything now. The Stylus brand is so casual and fun…so me, and so perfect for my casual lifestyle. And if your wondering how I could afford it since I quit my job, here's how: JCP always has great sales and coupons, and their coupons are good on sale and clearance items too (most stores don't offer that deal). I bought these pants on sale, plus I used a coupon, so I only paid $17.00 for them. What a deal! Even though I loved the boat neck shape on the sweater, I really liked the look when I added this scarf too. 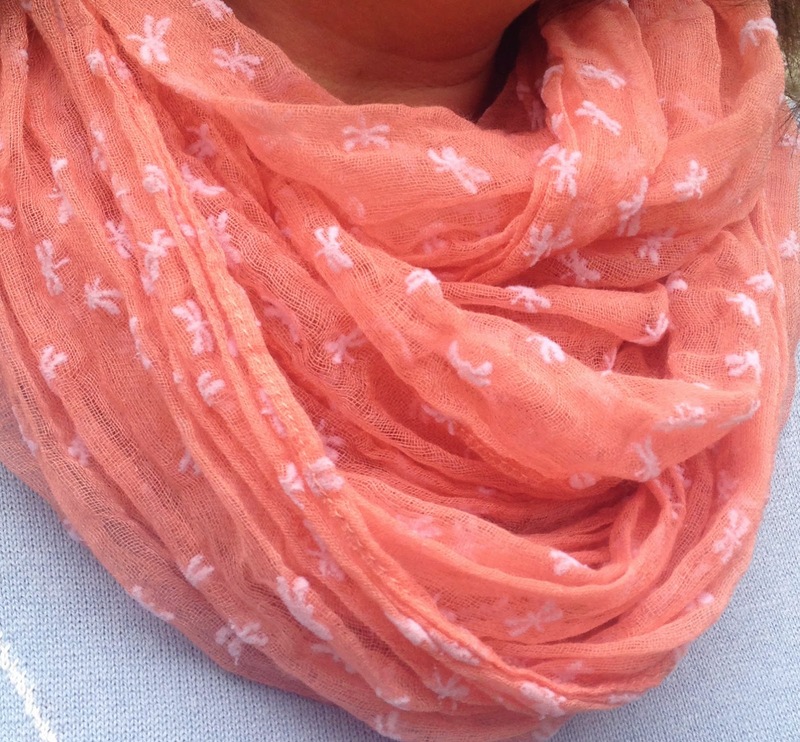 It's a lightweight, gauzy scarf with white dragonflies on it. I purchased it from The Icing several years ago and this was the first time I ever wore it. I've always loved this scarf, I just never had the perfect outfit to wear it with until now. It started to rain when we were taking these photos so I never got close ups of my jewelry, but you can see them a little bit in this photo. I wore coral drop earrings and a coral, beaded bracelet. Linking Up with: Style Sessions, Turning Heads Tuesday, Confident Twosday, All About You, Tucker Up, Oh, Hey Girl, Style Me Wednesday, Trendy Wednesday, Jersey Girl/Texan Heart, I Feel Pretty, Look What I Got, and Bloggers Who Have Inspired Me. Awww, you look so cute! Those striped pants are just so fun! I agree with you, the Stylus line has some great pieces. I just recently added a white denim jacket to my wishlist, so I will have to check out Kohl's. Love the striped pants and the boat top, like a seasside feel. Hi Amy, you look great, love the pants very much. Beautiful, comfortable, classy outfit! Absolutely love the sweater! Nothing wrong with being a walking J.C.Penney haha. The outfit is so cute and Spring-y, I love it! 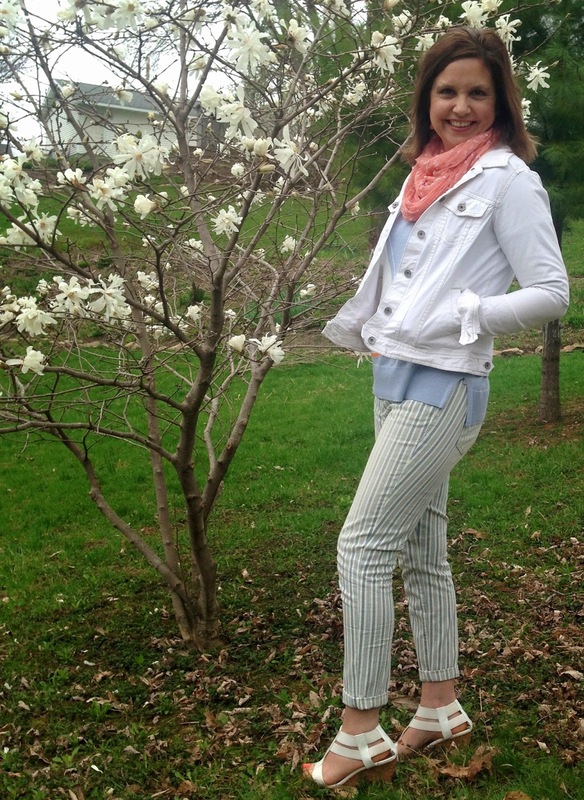 You look so happy and adorable in this spring colored outfit! 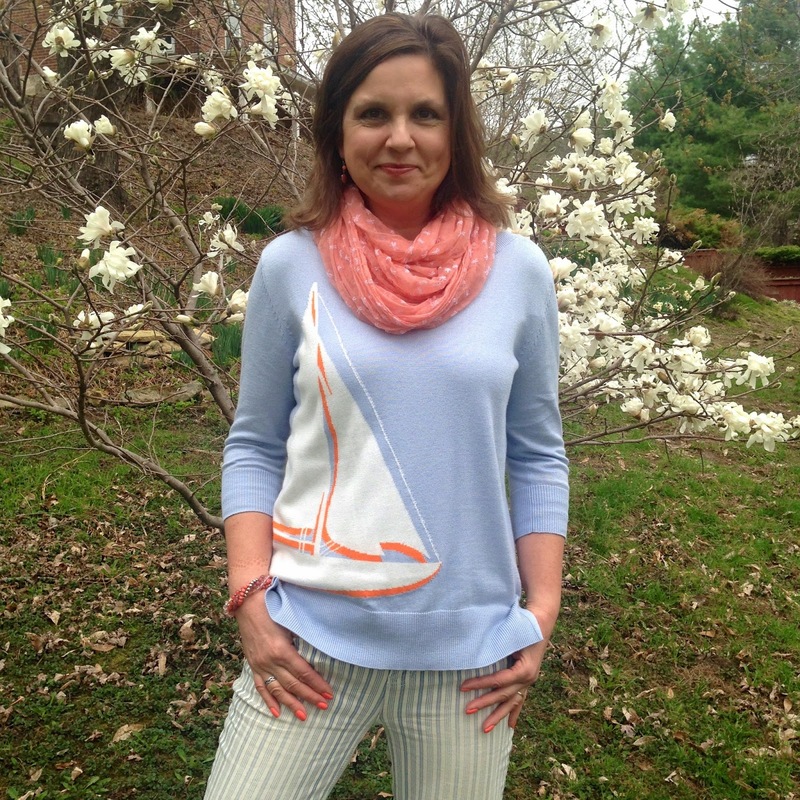 Love the sailboat sweater and those striped pants, too! what a great look, and very appropriate for summer as well. Cute top and pants. Thank you Amy for linking this post to "Bloggers Who Have Inspired Me" I can't wait for you to come back by and or link up next Tuesday.